The book of Ecclesiastes is King Solomon’s journal. In it he paints the tragic self-portrait of a man filled with regret. For us reading his journal we see his simple message—God is God and we are not. True wisdom requires us to read God’s Word with the goal of practical application, not merely intellectual stimulation. 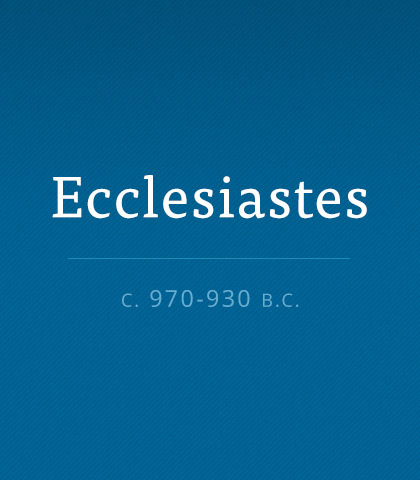 Ecclesiastes is not only the story of one man's experience but of all who attempt to live their lives apart from God. For King Solomon, life under the sun was a drab, dull, and depressing mess. He discovered if there’s nothing but nothing under the sun, then his only hope must be above it. Life to many people is nothing more than chasing excitement to combat monotony. Such is the bold, dreary message of Ecclesiastes 1. Solomon fell for the sensual lure of self-gratification. He landed in the pit of emptiness. With disillusionment and despair casting ever-enlarging shadows across his path, Solomon begins to intensify his reactions in Ecclesiastes 2:12-26. The Christian life is tough to get started because it’s not just a new way of thinking it’s a whole new way of living. It’s like moving from darkness to light; from being self-centred to being like Christ. But as you persevere, the journey keeps getting better and better. When we acknowledge God is in control (not us) it makes a difference in how we live...and in how we die.